The hacking group Anonymous says it will launch online attacks every weekend, following claims it disrupted access to the Home Office website. Anonymous Twitter messages warned of the attack on 4 April, and said: "Expect a DDoS (distributed denial-of-service) every Saturday on the UK Government sites." The Home Office site was inaccessible for several hours on Saturday night. Officials say no sensitive information was lost, and it is now back to normal. A distributed denial-of-service (DDoS) attack floods a webserver with so many requests that it can no longer respond to legitimate users. 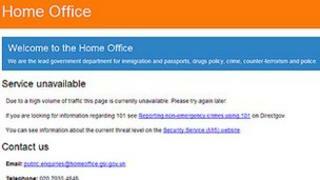 The Home Office website became inaccessible around 21:00 BST on Saturday, and was patchy from 05:00 on Sunday. It is not clear whether the protest was against email surveillance or extradition, but it could be both. One message on Twitter said it was a protest against "draconian surveillance proposals", but another claimed it was over extradition from the UK to the US. One tweet claiming to be from Anonymous said: "You should not give UK citizens to foreign countries without evidence. If an offence happened in the UK, so should the trial." There were also claims on Twitter that the 10 Downing Street website had been targeted as part of the same protest. This is the latest in a series of attacks on official websites claimed by the hacktivists since the start of the year. In January hackers who identified themselves under the Anonymous banner targeted the FBI and US Department of Justice following the takedown of the Megaupload file-sharing site, posting notice of the assault on Pastebin. The action was dubbed Tango Down - a military term adopted by hackers to reference an important site successfully taken offline. The following month the same phrase was used by the YourAnonNews twitter feed when the CIA's site went offline - although the feed later noted that just because it reported a hack did not mean it caused it. Other attacks credited to the group include take-downs or defacements of sites belonging to the Vatican, Interpol and the Polish and Chinese governments, as well as the release of emails alleged to have been stolen from the Syrian Ministry of Presidential Affairs. This was dismissed by a Downing Street spokesman - but access to Number 10's site was slow and intermittent for a time. Last month the Commons Home Affairs Select Committee said major changes were needed to the UK-US extradition treaty to restore "public faith". The MPs said they believed it was "easier to extradite a British citizen to the USA than vice versa". Gary McKinnon, who has Asperger's syndrome, has been fighting extradition to the US for 10 years. Mr McKinnon, of north London, is accused of hacking US military computer systems in 2002. Chris Tappin, of Orpington, south-east London, was extradited to the US on 24 February over allegations of arms dealing. It has been claimed he conspired to sell batteries for use in Iranian missiles. Student Richard O'Dwyer, of Chesterfield, is also fighting extradition on copyright infringement charges on a website he ran from the UK. Earlier in the week the Home Office said it planned to "legislate as soon as parliamentary time allows" to bring in email surveillance measures. Ministers say change is needed to help fight crime and terrorism, but critics warn it is an attack on privacy. A spokeswoman said: "The Home Office website was the subject of on online protest last night. "This is a public facing website and no sensitive information is held on it. "There is no indication that the site was hacked and other Home Office systems were not affected." She said measures have been put in place to protect the website, and the Home Office will monitor the situation. Anonymous is a loose group of "hacktivists" who came to the fore in 2010 in the wake of the emergence of Julian Assange's Wikileaks website. Anonymous began by aiming DDoS attacks on websites, like the credit card firm Visa, who had withdrawn services from Wikileaks. But it has gradually changed into a grouping which claims to battle government surveillance and attempts to police the internet. Earlier this week Anonymous claimed to have defaced almost 500 websites in China. A message put on the hacked sites said the attack was carried out to protest against the Chinese government's strict control of its citizens.